The Earth's building blocks seem to be built from 'pretty normal' ingredients, according to researchers working with the world's most powerful telescopes. Scientists have measured the compositions of 18 different planetary systems from up to 456 light years away and compared them to ours, and found that many elements are present in similar proportions to those found on Earth. This is amongst the largest examinations to measure the general composition of materials in other planetary systems, and begins to allow scientists to draw more general conclusions on how they are forged, and what this might mean for finding Earth-like bodies elsewhere. 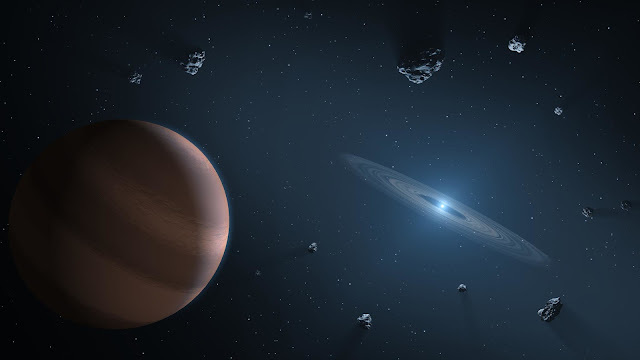 "Most of the building blocks we have looked at in other planetary systems have a composition broadly similar to that of the Earth", said researcher Dr Siyi Xu of the Gemini Observatory in Hawaii, who was presenting the work at the Goldschmidt conference in Boston. The first planets orbiting other stars were only found in 1992 (this was orbiting a pulsar), since then scientists have been trying to understand whether some of these stars and planets are similar to our own solar system. "It is difficult to examine these remote bodies directly. Because of the huge distances involved, their nearby star tends to drown out any electromagnetic signal, such as light or radio waves" said Siyi Xu. "So we needed to look at other methods". Because of this, the team decided to look at how the planetary building blocks affect signals from white dwarf stars. These are stars which have burnt off most of their hydrogen and helium, and shrunk to be very small and dense - it is anticipated that our Sun will become a white dwarf in around 5 billion years. Dr Xu continued, "White dwarfs' atmospheres are composed of either hydrogen or helium, which give out a pretty clear and clean spectroscopic signal. However, as the star cools, it begins to pull in material from the planets, asteroids, comets and so on which had been orbiting it, with some forming a dust disk, a little like the rings of Saturn. As this material approaches the star, it changes how we see the star. This change is measurable because it influences the star's spectroscopic signal, and allows us to identify the type and even the quantity of material surrounding the white dwarf. These measurements can be extremely sensitive, allowing bodies as small as an asteroid to be detected". The team took measurements using spectrographs on the Keck telescope in Hawaii, the world's largest optical and infrared telescope, and on the Hubble Space Telescope. Siyi Xu continued, "In this study, we have focused on the sample of white dwarfs with dust disks. We have been able to measure calcium, magnesium, and silicon content in most of these stars, and a few more elements in some stars. We may also have found water in one of the systems, but we have not yet quantified it: it's likely that there will be a lot of water in some of these worlds. For example, we've previously identified one star system, 170 light years away in the constellation Boötes, which was rich in carbon, nitrogen and water, giving a composition similar to that of Halley's Comet. In general though, their composition looks very similar to bulk Earth. This would mean that the chemical elements, the building blocks of earth are common in other planetary systems. From what we can see, in terms of the presence and proportion of these elements, we're normal, pretty normal. And that means that we can probably expect to find Earth-like planets elsewhere in our Galaxy". Dr Xu continued "This work is still on-going and the recent data release from the Gaia satellite, which so far has characterized 1.7 billion stars, has revolutionized the field. This means we will understand the white dwarfs a lot better. We hope to determine the chemical compositions of extrasolar planetary material to a much higher precision"
"It's astonishing to me that the best way to study exoplanet interiors is by planets ripped apart and absorbed by their white dwarf host star. It is great to see progress in this research area and to have solid evidence that planets with Earth-like compositions are common--fueling our confidence that an Earth-like planet around a very nearby normal star is out there waiting to be found".